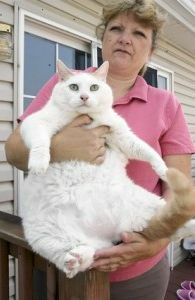 If you want to know the record holder for the heaviest cat in the world, then you're in the right place. The heaviest recorded cat is Himmy who lived in Cairns, Queensland, weighing in at a staggering 21.3kg (46.8lbs). Himmy, a desexed tabby died at the age of 10 of respiratory failure. As of February 2003, there is a new contender for the world's heaviest cat. Five year old Katy, who lives in Russia reportedly weighs 20kg. Did you know that the largest cat breed is the Ragdoll. Males weigh twelve to twenty pounds, with females weighing ten to fifteen pounds. The smallest cat breed is the Singapura. Males weigh about six pounds while females weigh about four pounds. Check also here the oldest living cat or the oldest dog. For a list of the most extreme known achievements in the planet, check our top world records. The oldest living cat is Creme Puff of Austin Texas. Born on August 3rd 1967, Creme Puff celebrated her 38th birthday in August 2005. Like us, cats get old too, and getting old is not all bad. Each stage of life has its joys, pleasures and drawbacks. Middle age for a cat is between 8 and 10 years of age, which is a kind of gray zone during which the cat is fully engaged in the process of life without any particular physical or mental deterioration. At the end of middle age, cats start acting and feeling their age. This effects of the aging process are both physical and mental. Physically for example manifest itself when structural and functional changes occur in virtually all organ systems throughout the body, affecting vision, hearing, stamina, susceptibility to drugs and locomotor activity. Mental changes on the other hand are secondary to decreasing brain size and a reduced number of brain cells. In some cases, feline Alzheimer-like changes hasten deterioration.